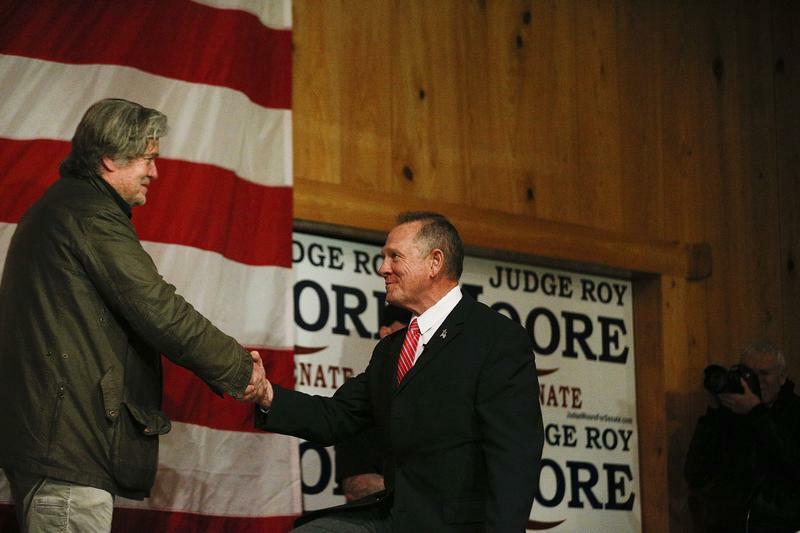 Steve Bannon, left, introduces U.S. senatorial candidate Roy Moore, right, during a campaign rally, Tuesday, Dec. 5, 2017, in Fairhope, Ala.
BOB GARFIELD This is On The Media, I'm Bob Garfield. The Matrix, of course, is science fiction purporting to reveal the dark forces that enslave us. That is so 20th century. Now, we have actual political kingmakers claiming the same thing. If Morpheus had floppy hair and wore three shirts, he would be Steve Bannon, the strategist and self-styled political philosopher who has seen The Matrix and what he calls the administrative state. He was Donald Trump's Iago, his Rasputin. [CLIP OF SATURDAY NIGHT LIVE]. ALEC BALDWIN AS PRES. DONALD J. TRUMP Send in Steve Bannon. BOB GARFIELD His grim reaper, death in a mask. BOB GARFIELD But a new documentary takes a peek at the man behind the mask. Titled "The Brink," the movie follows Bannon through his various battles after getting the heave ho from the Trump White House. We join him at a low point as his candidate Judge Roy Moore is upset in the Alabama Senate special election. We see him grooming hard right congressional candidates for the midterms. We see him coalition building among right wing extremists in advance of the upcoming EU elections. Here he is holding forth for journalists, here dining with fascists and, oh yes, again and again charming audiences coast to coast. FEMALE CORRESPONDENT Oh my god. I'm so excited. Steve Bannon. I love him. BOB GARFIELD Alison Klayman is the director and co-producer of "The Brink." Alison welcome to OTM. ALISON KLAYMAN Thank you so much. BOB GARFIELD I want to ask you about the relationships that he's cultivated in the press. He notoriously was the key leaker of information to Michael Wolff for his tell all bestseller Fire and Fury. Through your movie, we see him engage with Bloomberg Joshua Green, Annie Karni, who at the time worked for Politico. STEVE BANNON Did we get the trailer? STEVE BANNON Can I see the new trailer? MALE CORRESPONDENT Yeah, hold on. I'm looking at it right now. BOB GARFIELD Maggie Haberman, White House reporter for The New York Times. After the Tree of Life synagogue shooting in Pittsburgh where so many worshipers died. We see him texting Ken Vogel of the Times. From your perspective are these relationships transactional? You know, are they a series of seductions? Is it a question of just keeping your enemies close? What do you make of that? ALISON KLAYMAN So I don't think he thinks that they're his enemy at all. I do think it feels very transactional but I also think a lot of them do like him. He is like, 'yeah I love journalism. You know they're working hard they're trying to do their job. They have information. They have networks. It's a great way for me to find information too.' And you can see blatantly he is planting or spinning stories the way he wants them to go out. And of course the journalists, you know, take it in and then if they're doing a good job, they're not just doing stenography. Others are tweeting every statement he's making. And, you know, like it's almost like he's there beat. BOB GARFIELD There's this one scene, fairly late in your film, with Paul Lewis of The Guardian in which Lewis savages Bannon to his face for dog whistling anti-Semitic tropes. PAUL LEWIS Let me just say what Errol Morris said. He said, 'Steve Bannon will doubtlessly stated that his remarks were not anti-Semitic but I would respectfully disagree. He knew what he was doing.' He's suggesting that you are doing dog whistle anti-Semitism here and you'll notice--. STEVE BANNON I just disagree with Errol on that. PAUL LEWIS Is the term globalist and anti-Semitic--. PAUL LEWIS There are people who would argue that it is. George Soros. I mean it is widely accepted as an anti-Semitic trait. The used--the suggestion that George Soros is somehow owned or controlling, he is influencing, everybody knows--. STEVE BANNON George Soros is the biggest--. PAUL LEWIS This isn't something to disagree with because it is an anti-Semitic trait. STEVE BANNON What, no. George--that's just cause you stated doesn't mean that it's true. STEVE BANNON I didn't say control of the world. STEVE BANNON I said--I said he says he's the financier and back of the NGO. PAUL LEWIS So you are aware that many people will read that as being a nod and a wink toward anti-Semitism. ALISON KLAYMAN He was definitely like, 'I need to make sure I get it all in because, you know, Bannon's probably not going to want me back.' But Paul filmed with him several times after that, actually. You know much to his surprise. I think, to me, that such a good reminder of this two-way street. And Bannon needs the press as well. You might be risking that he doesn't like you individually, personally. And look Michael Wolff is still around after Fire and Fury came out in which a lot of the consequences of his participation in that book, it seemed like they were pretty embarrassing for Bannon. That's what precipitated the sloppy Steve comments from Trump who otherwise was going for the jugular with Bannon in public. BOB GARFIELD So one could conclude that the guy is just so narcissistic he wants attention no matter the cost to his dignity. But Bannon himself has another explanation. Here he is with his confederate Raheem Kassam when they were at a sit down with a bunch Euro fascists. RAHEEM KASSAM They're obsessed with by us. RAHEEM KASSAM Right? The Atlantic writes a thousand word article today about like three meetings Steve took over the last few days. Right? ALISON KLAYMAN When Bannon is talking in that clip, the larger context of that is he's having a dinner with members of various far right parties from France, Sweden, Belgium and they were actually asking him what could we do to strengthen our position in the future. And one of the things they talk about is to be successful at the upcoming 2019 May EU parliamentary elections. And 'what about the media you know should we have Breitbart for Europe. Should we have some kind of right wing media organization that we started up?' And he was saying that actually the right wing media, the model is becoming unsustainable. It's going to have to move entirely to a philanthropy model because the advertisers have been fleeing. MALE CORRESPONDENT So it's through advertising still. ALISON KLAYMAN And in large part it has been because of citizen and consumer outcry. This movement that notifies advertisers that they're appearing on these sites and then they get the companies to block their ads from getting placed on these specific sites and it keeps happening more and more. But where you can get traction and you don't need to pay for it is the mainstream media. And when he's talking about that I really do think he's talking about, especially, constantly dominating news cycles. And I think, as they're talking about, you know, someone just right writing an article about a few meetings Banon held. Now again, I think it's worth figuring out what's happening at these meetings. But is there enough context provided in the article. And again the danger of those far ranging interviews. ANDERSON COOPER Steve Bannon and joins me now from Rome. ALISON KLAYMAN For a half hour, live from Rome, you know, being asked about his thoughts on the Mueller report and 2020. STEVE BANNON I was talking to Spanish journalists and I think I said honey badger, which is you know is one of my favorite phrases. STEVE BANNON I don't think the presidents going to be--. ANDERSON COOPER Honey badger don't care. ALISON KLAYMAN You know Bannon was live from Rome in that interview. And the first question wasn't, 'so tell me about what you're doing in Rome.' Like it was just, you know, OK we have we have Bannon in here. Let's ask him things.' And I just don't think he's a figure that should be treated that way. BOB GARFIELD Now I should say that your film ultimately is the most unflattering portrait of Steve Bannon–on many levels. It catches him pronouncing cavalry as calvary and zeitgeist as Zeit-geese, which I find delicious. BOB GARFIELD It catches him losing his temper. It catches him using the same condescending and vaguely sexist dad joke over and over when posing with women at events. STEVE BANNON Over here, get in the middle. BOB GARFIELD It catches Ben and breaking bread, as we discuss, with the worst of Europe's fascist firebrands. It catches him lying about the anti-Semitic bedrock of his supposed movement. And maybe, most importantly, it shows his candidate Roy Morgan being defeated in Alabama's special senatorial election followed by Bannon and his handpicked candidates getting their asses handed to them in the midterm elections. STEVE BANNON Which he described as a referendum on the Trump presidency. So net net, you know not the greatest PR piece for him. On the other hand, in his calculus, attention is currency. He says so in your movie. BOB GARFIELD We know he thinks that being in your film was a good bet. But I'm asking you, what does society gain from "The Brink" and what does it risk? ALISON KLAYMAN Of course there can be a risk. This is something that I fought about every night when I went to sleep. But one of my biggest inspirations to make this was my relationship to the Holocaust and Holocaust legacy. My grandparents are Holocaust survivors. And to me, it's a real question, for now, as I think there are a lot of parallels in this time for, you know, how does this society get to a place where these things can happen? The fact that, you know, people are writing about it and talking about it as you are and raising questions that are bigger than him. And experts, you know, the world's leading expert in populism, people like Cass Mudde, who all say, 'yes this is a film that is exposing not just the tactics the strategy but what's going on right now. What's about to happen.' I do feel like this is an intervention and it's a contribution because it was made with all of these concerns and questions, you know, at the forefront. BOB GARFIELD The movie is called "The Brink," the brink of what? ALISON KLAYMAN I mean I think we all can feel that we are at the brink, the brink of what? Going from Brexit it to the election of Donald Trump to ongoing climate disaster, also the wealth gap in the way that the rich are getting richer and the poor not advancing, all of this is a real recipe for evil forces to be able to succeed. You know, I didn't want to be anything that felt like it was referencing just him because I think the whole point of the film is a look behind the curtain at a whole system and big part of this system is how he uses the media. It's the kinds of hateful messages and cruel policies that he's willing to put forward. But also, that it's heavily funded and that for all of his talk about being for the little guy and trying to shake things up, it's very clear that his position is among the super rich and I think a figure like Bannon is only going to succeed as far as the whole system allows him to. And it's not just about the media attention. I think the media should be paying more attention to the money and holding it up against the rhetoric. BOB GARFIELD Alison, thank you very much. BOB GARFIELD Alison Klayman is co-producer and director of "The Brink," in theaters now. BOB GARFIELD That's it for this week's show. 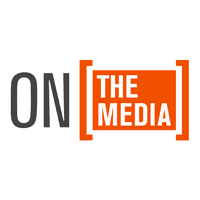 On The Media is produced by Alana Casanova-Burgess, Micah Loewinger. Leah Feder, Jon Hanrahan and such out of vedi. We had more help from Xandra Ellin and Sherina On. And our show was edited this week by our executive producer Kaya Rogers. Our technical director is Jennifer Munsen and Jen, the speediest of recovery to you. Our engineers this week were Sam Bair and Josh Han. On The Media production of WNYC studios. I'm Bob Garfield.